Metropolitan communications the installer of the call recording system at Perpetual Treasuries informed the Bond Commission today, that the recording system they had installed at Perpetual Treasuries was deleted on July 6, and files had been selectively copied by the company. Taking another dramatic turn at the commission, the Chief Engineer of Metropolitan communication Nalin Dharmarathme who took the witness stand in the middle of cross examination of Perpetual CEO Kasun Palisena confirmed that the evidence presented to the Commission by Perpetual Treasuries was fabricated and tampered with. He said that the call recordings provided to the commission were not from the system Metropolitan had installed. The Attorney Generals Department earlier, repeatedly questioned Palisena regarding missing recordings. The Department also said that unlike all other recordings provided to them by entities, the recordings provided by Perpetual had no serial numbers and caller IDs. Palisena repeatedly kept saying that this was all the company had and that he had given all recordings to the commission. Palisena confirmed that the Commission had been given the exact recordings as they were also through an afffidavit which was read out at the Commission. 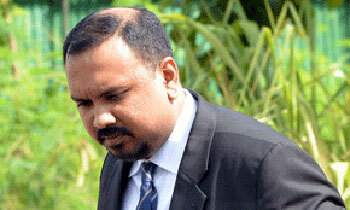 Lawyer for Perpetual Nihal Fernando also repeatedly told the Commission that Perpetual had given everything in their possession and that they could not provide any of the other details including caller ID numbers and the call durations as the system did not possess the information. However, according to Dharmarathne’s testimony today Perpetual had been lying to the Commission throughout. The Attorney General’s department said the witness and the company must be held in contempt of the Commission.